The Israeli separation barrier is depicted from the Israeli side of the wall. The cubicles symbolize the wall imprisoning each Palestinian village. The billboard on the horizon speaks to the Israeli billboards advertising move-in specials in settlements built on Palestinian property, destroyed homes. 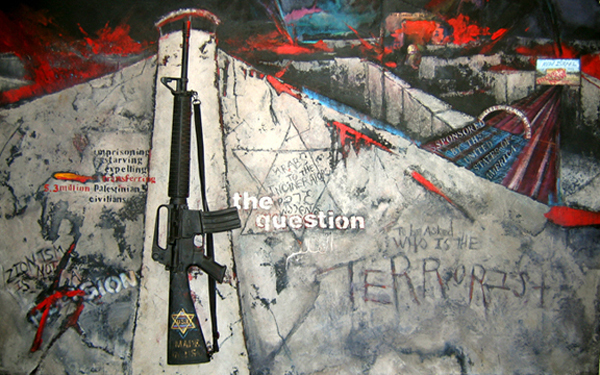 The replica M-16 references the United States government issued rifles and ammunition given to new immigrants, settlers, upon arrival in Israel. The graffiti “All Arabs to the incinerators” replicates graffiti painted on Palestinian homes by Israeli settlers.